In eighteenth-century England, the law surrounding vagrancy was complicated, and practice stood in complex relationship to law. Drawing on extensive archival research and in-depth study of both statute law and local administrative records, this book examines the complexities of vagrancy law and the realities of its practice during the long eighteenth century. It shows how settlement law and poor law provision failed to address both the changing demographic situation and the impact of wars, leaving significant numbers without support. Focusing on the 1744 Vagrant Act, the study traces how and why the law evolved, from 1700 when vagrancy was first made a county charge, and what changes followed in the late eighteenth and early nineteenth centuries. It explores how vagrancy law was used and to what effect, how it was extended and adapted to plug gaps in both poor law provision and in dealing with petty crime not covered by statute law, and how law and practice intersected with social reality. Using the Quarter Sessions records of six counties: Westmorland, Cambridgeshire, Dorset, Hampshire, Lancashire and Middlesex, the book is able to give the first account of vagrancy law in provincial England, rather than focusing on metropolitan areas, thus also demonstrating the tensions between parishes, justices and counties over the use of law and its financial impact. By detailed reference to cases of individual vagrants, the book also shows what sorts of people were dealt with under vagrancy law, what happened to them, and how and why the justices discriminated between the unfortunate and the criminal elements among them. This analysis reveals the principal causes of the vagrancy problems and the misfit between the law and social reality, with particular emphasis on the impact of wars and immigration from Ireland and Scotland. 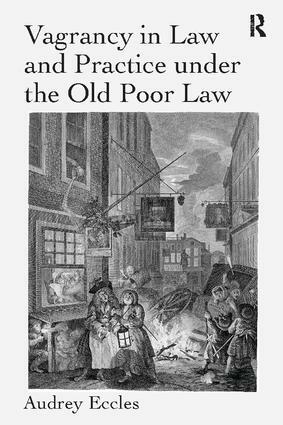 As the first full-length study of vagrancy law and practice in the eighteenth century, this book will constitute an essential item in any collection of books on the old poor law. Audrey Eccles, a retired archivist, gained her PhD in 1974 for work on the history of obstetrics, published in 1982 by Croom Helm. She began working on vagrancy while calendaring the eighteenth century Quarter Sessions rolls at Kendal Record Office, Cumbria, and has subsequently researched the subject in five other counties. Her pilot study was published in 1989 and she has written a number of papers on vagrancy since.